A white filling, also known as a composite resin filling, is made from a plastic mixture containing very small glass particles. 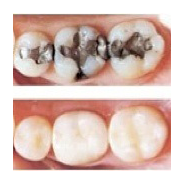 White fillings offer patients many advantages over traditional amalgam fillings. First of all, the resin fillings can be color matched to your teeth, offering a more visually pleasing cosmetic alternative to filling cavities. Secondly, these resins are actually bonded to your teeth, not just inserted into a defect in the tooth. This actually strengthens the tooth and prevents additional breakage. Thirdly, when you eat or drink hot and cold food and beverages, the composite expands and contracts like teeth. 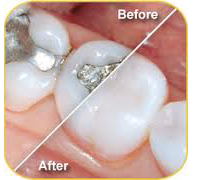 Amalgam expansion is much larger and could cause tooth damage. How is a white filling placed? The decayed portions of the tooth must be removed first, which leaves a defect that needs to be filled to restore the tooth to its original form and function. The tooth is prepared and etched with a mild acid solution. A glue called bonding agent is applied to the tooth. The composite is then placed in layers with a specialized light that is used to harden each layer. When the process is done, the filling is adjusted and shaped to fit the tooth. The tooth is polished to prevent staining and premature wear. How long does it take to place a white filling? It takes the dentist a few minutes longer to place a composite than a silver filling. Placement time depends on the size and location of the cavity. The larger the size, the longer it takes. However, most patients consider the results well worth the additional time and slightly higher cost. The composite enables Dr. Mazza to blend the shade of the composite to create a color nearly identical to that of your actual tooth, and provide a durable restoration of your tooth. You will receive instructions on how to take care of your new composite filling to prevent staining and promote its durability. Will my insurance cover this type of filling? A majority of dental plans cover the composite fillings for the back teeth. It is prudent that this matter be checked prior to your appointment.